It is not news that extraordinary paintings were made in Haiti during much of the 20th century. The artists, largely self-taught, started becoming known in the 1940s, when the Centre d’Art in Port-au-Prince, which offered studios, classrooms and galleries, was founded. Still, their achievement, like that of so many so-called outsiders, has yet to find a place in mainstream art history. Hence the continuing necessity — and thrills — of gallery shows like this one. The Edward Thorp Gallery mounted two previous Haitian shows: an exhibition of paintings, sequined voodoo banners and ironwork in 2007 and a survey of painting in 2008. This one zeroes in on four major talents, presenting their often small paintings in quantity, which is rare. The show’s varied subjects and styles emphasize the overheated mixture of everyday life, voodoo faith, incessant political turmoil and Edenic natural beauty, along with European and African folkloric traditions, that give Haitian painting its special force and poignancy, and its fervent plasticity. There is something implicitly tense in the rural scenes and flowers favored by Wesner La Forest (about 1927-65), whose spatial sense has much in common with that of Bill Traylor, the American master of taut silhouettes, but whose colors and surfaces are his own. 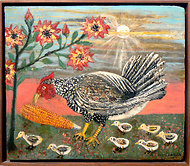 Peterson Laurent (1888-1958) painted parades and elaborate churches but seems most at home with dense, almost hallucinatory renderings of flowers and creatures, like the monumental “Rooster and Chicks,” or a scene of frolicking fish that includes an American battleship in the distance. The great Odilon Pierre (1933-98) worked in a range of styles, from raw images of raised fists and frenzied faces to impacted landscapes where people, animals and trees jostle for space amid shifting colors and paint textures. In this context the wide-angle views of villages and harbors of Bourmand Byron (early 1920s-2004) exemplify a relative serenity of surface; but his air of fantasy can turn nightmarish, as it does in “Village Sacrifice,” which details a voodoo ceremony with splashes of red. This is an astounding show, not the least for the ways the artists combine and recombine aspects of landscape, protest, social realism and history painting without sacrificing what the art-auction world likes to call “wall power.” It reminds us that such power comes in all shapes and sizes and most reliably from the crucible of life. It also reminds us that much of the history of modern painting remains to be written, and that it can only get bigger, messier and better. A version of this review appeared in print on April 6, 2012, on page C28 of the New York edition with the headline: ‘Haitian Masters’: 1950s-1980s.